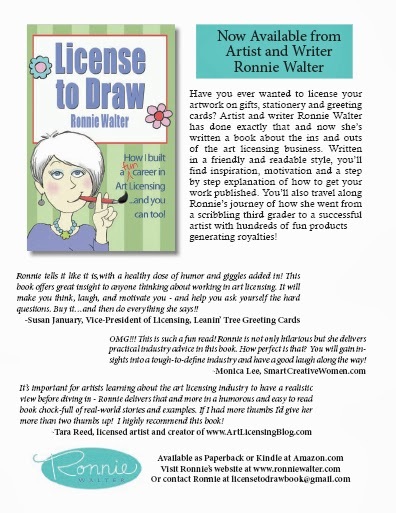 Licensed artist and licensing agent Ronni Walter of Two Town Studios has released a book about her story in learning to be an artist and licensing her work for products. "License to Draw" not only describes hilarious accounts that took place during her journey but also provides a lot of information about licensing including protecting your work, getting clients, and exhibiting at licensing trade shows. Her book can be purchased as a paperback book or a Kindle e-book on amazon.com. Note: A GREAT introduction to the book is the video "Ronnie Walter, artist, writer and smart alec" on "Smart Creative Women with Monica lee". Ronnie discussed such things as there is no cookbook method to licensing art, how people now shop and its impact on art licensing, and how you need to create art by thinking about the product before creating the art. 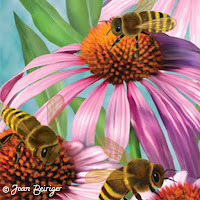 The video and book are a MUST view/ read for those new to art licensing. And, even seasoned licensed artists will get some important reminders and may even some new information about the industry. Comments are welcome. Click on the comments section (below) to write your comment. Note: Some people have a problem in leaving a comment. The most successful method is to comment as Name/URL (your name and website or blog with a complete URL address). Corresponding via Email is the number one method in contacting persons in the art licensing industry. And, if those Emails end up in the recipients junk folder instead of their inbox, possible licensing consideration of art and important information may never be seen. Thus, it is important to know the words that should be avoided in the subject line and in the content of the Email that will trigger it as spam. Spam filters constantly change and depends on the recipients Email gatekeeper. As stated in "Spam Filters: The Truth about Email Marketing Gatekeepers", they block not only words but also symbols, writing in all caps, aggressively urgent language and especially trigger words in subject lines. 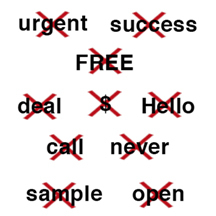 Some spam words are innocuous such as now, never, success, sample, deal, hello while others are more obviously as spam such as free, earn $, income, get, urgent. It is impossible to avoid all the words on spam lists when writing Emails. One word will not trigger it as spam but it will if the Email is over loaded with too many or the same word or phase is repeated too many times. Also avoid sending Emails with only a few words, or only a link to a website, or only one picture because spammers constantly do it. And, most importantly focus on the subject line of the Email. Avoid spam words but make sure it is engaging so that the recipient will read it. Below are links to lists of spam trigger words. • "The Ultimate List of Email SpamTrigger Words"
• "Common words that trigger spam filters"
• "Spam Filters: The Truth about Email Marketing Gatekeepers"
• "A List of Common Spam Words"
Note: There are online tools that analyze Email content to test for spam trigger words. I have not used them because they require you to enter your Email address. I am leery that I may get spam if I give them my Email address since many are selling Email marketing services. But, if you are interested, checkout "Top Sites about: Spam Checkers."